We have launched our first Instagram Competition! 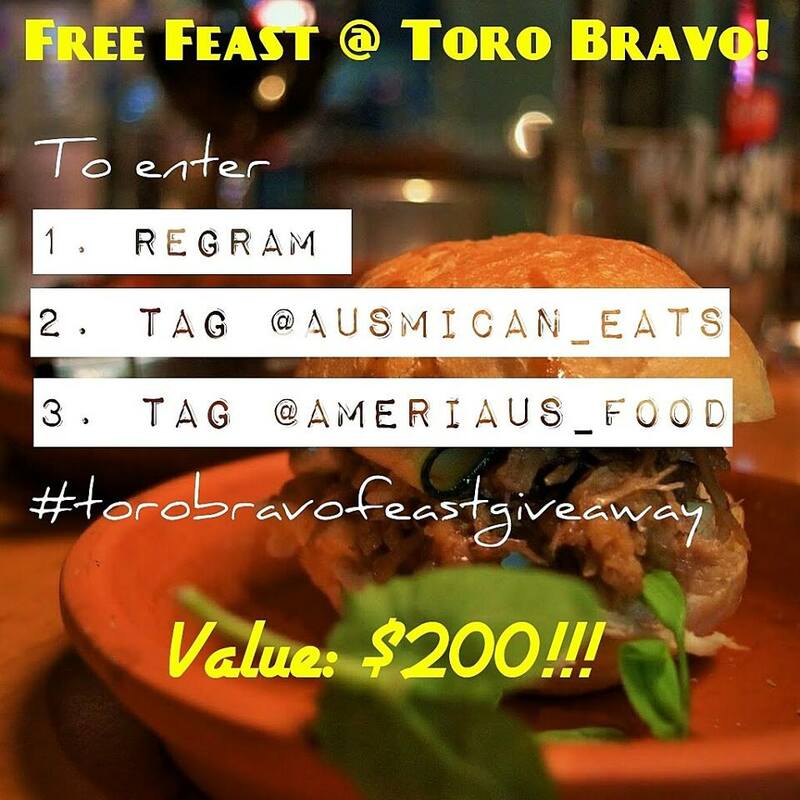 If you are following us on Instagram you could win an awesome feast at Toro Bravo in Fortitude Valley (value: $200) If you attended Eat Brisbane #1 you know how awesome Toro Bravo is. Toro Bravo specializes in tapas and char-grilled steaks. Go crazy and treat your friends to an extravagant tapas feast OR take your special someone on a romantic dinner date. You've got to be in it to win it, so get your entries in now! Check out our review of Toro Bravo HERE and drool over all the delicious dishes you could devour with your $200!!! This giveaway is only open to followers of @ameriaus_food and @ausmican_eats on Instagram. Head to our Instagram accounts for instructions on how to enter. 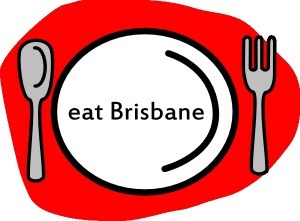 Eat Brisbane takes place on Saturday, July 19 at Sing Sing Vietnamese & Chinese Restaurant in West End. Those lucky enough to snag a seat at the third EB insta-eat will be treated to a very special Vietnamese banquet. With awesome dishes like Beef Noodle Soup (Pho Bo) & Vietnamese Crepes (Banh Xeo) on the menu it's sure to be an incredibly delicious lunch! Registrations for EB3 are closed but don't fret. Applications for EB4 will soon open. Make sure you are following @eatbrisbane on Instagram. This is where we announce first when applications have opened. If you represent a restaurant and would like to sponsor a future EB event please send us an email at ameriausblog@gmail.com and we will send you an EB info brief. 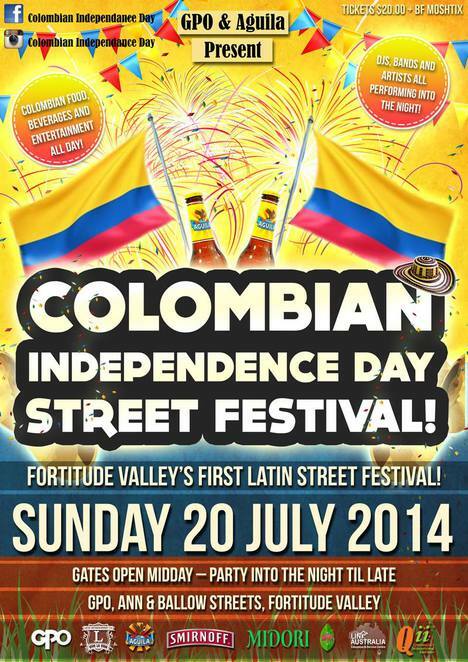 The Colombian Independence Day Street Festival takes place this Sunday, July 20 in Fortitude Valley. As the the flier states this is the Valley's first Latin street festival. It's a party you do NOT want to miss. The festival honours Colombia's Independence Day so it is sure to be bursting with vibrant Colombian culture. Gates open at 12pm. This event is open for ages 18+. Some of the festivities include: scrumptious Colombian food, exotic cocktails, live music, and dancing! Tickets are $20 (plus a small booking fee) and can be purchased HERE. See you there! 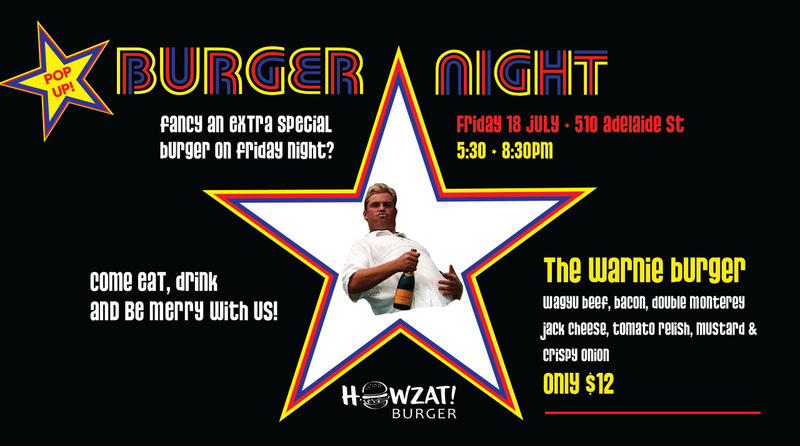 Popular burger joint Howzat Burger is having another exciting Pop Up event! Burger Night takes place on Friday, July 18 from 5:30-8:30pm. Howzat will be launching a new burger creation called "The Warnie". "The Warnie" is a heavenly stack of Waygu Beef, Bacon, Double Monterey Jack Cheese, Tomato Relish, Mustard & Crispy Onion. The burger is only $12 ! Friday night plans sorted! 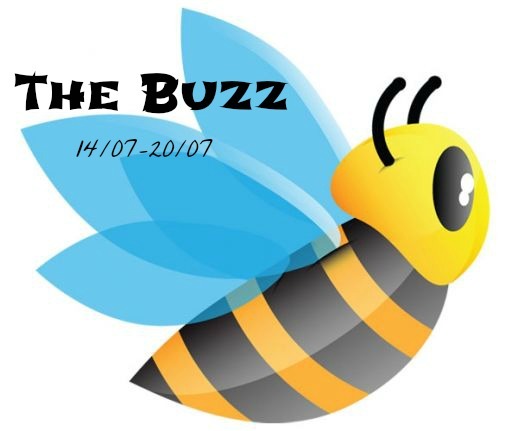 Check out our review of Howzat Burger HERE. Last but certainly not least... Regional Flavours kicks off this weekend. 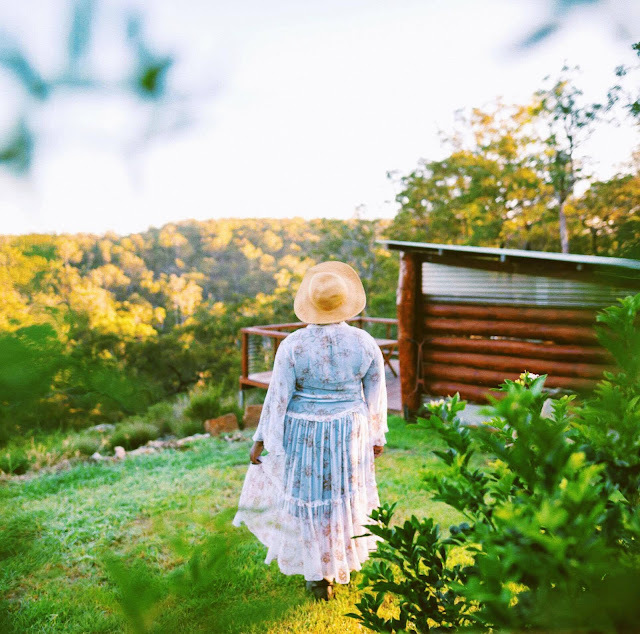 Don't dare call yourself a Brisbane foodie if you have not heard about this event! This is the equivalent of Christmas day for foodies. Regional Flavours is Southbank's signature food festival. The festival is held every year in the beautiful Southbank Parklands. The festival consists of a host of children's activities, live cooking demonstrations, and local & celebrity chefs and experts. There will be over 60+ restaurants, bars, and food trucks present at the festival so bring you appetite! This is sure to be a very gluttonous weekend. Eat-Show-Tell: This event gives the community the opportunity to get up close & personal with some of TV's most popular chefs. Attendees will witness fabulous cooking demonstrations from the pro's. If you are an amateur cook this is the event for you. 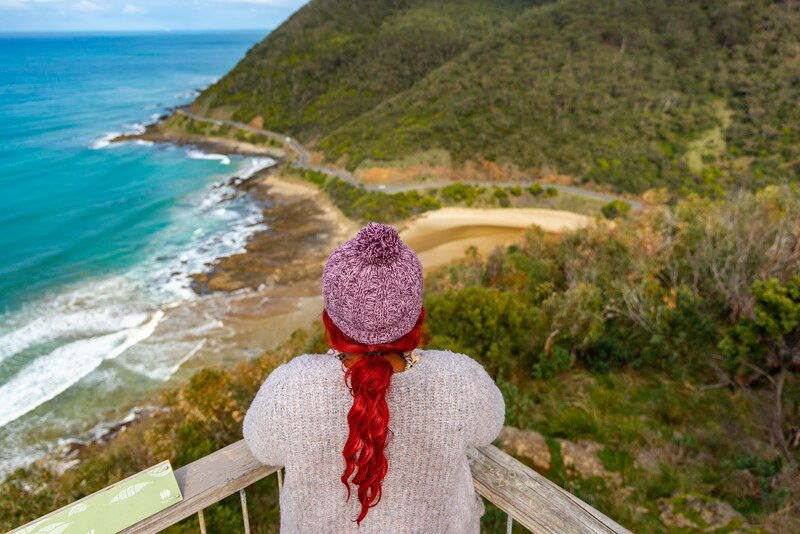 The Hunting Club: The exclusive hunting club presented by Nothing Beats Beef, Target 100, and South Bank Surf Club is the place to be this weekend. Those lucky enough to be 'hunted' will be spoiled with cold craft beers, an incredible BBQ, and live cooking demonstrations. For more information on Regional Flavours check out their website HERE.